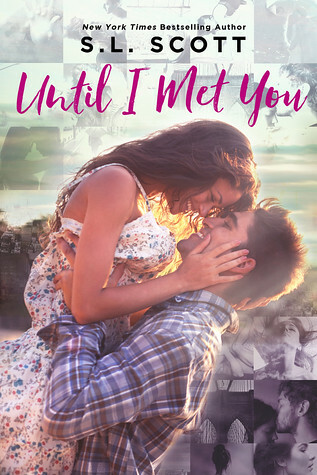 Until I Met You was kind of a train wreck for me. The first half I couldn't look away. It wasn't the best, but I just couldn't stop reading it as I wanted to see what happened. Then about halfway through when I was going to put it down there popped up another intriguing detail so I continued on to see what was really going on. Unfortunately it just crashed and burned from there. It was a bit too convoluted and not for me. This books starts off with Taylor and Jude meeting at a fancy party. Jude is kind of crazy and I thought she seriously had some mental health issues. She didn't seem fun and crazy, she just seemed like she needed some help. And Taylor? He is this buttoned up guy who doesn't really have anything in his life he is really living for and is drawn to Jude for some reason. He loves her zany ways, but it just bothered me. I kept reading to see if she was in fact in a manic phase or something. So Jude has a lot of secrets and she doesn't share them with Taylor. Bad stuff happened in her past and is still happening. She was a bit all over the place for me so I couldn't connect with her. Really I couldn't connect with either character and didn't really understand why they fell in love. I didn't see it. Sure Taylor tries to help Jude as best he can, and he does in the end, but it wasn't that good. I didn't understand a lot of what happened - like why Jude and Taylor had to keep pretending to not be a couple when the jerk guy catches them even though Jude planned on telling her parents about them when they got home. Why? It is better to let creepy jerk guy be creepy and a jerk all afternoon? I didn't understand so it didn't work for me. I don't want to spoil anything, but the plot gets just a bit ridiculous by the end. Some characters are these perfect caricature of villains and I didn't like it. And Taylor is not really the best either. He is so passive and can't seem to tell people what he really wants/doesn't want. Like his ex. He needs to be way more assertive there and not meet up with her or anything if he wants a clean break. It was...I didn't like him that much. Especially when he was first starting to see Jude. He did some things, kept some things hidden, that he really shouldn't have. And Jude was just so weak I hated it. She would see Taylor talk to another girl and instantly be all of course he doesn't like me, and walk away all dejected and sad and I couldn't deal with it. So I didn't care for either main character, the plot was a bit of a wreck for me, overall it was not a very good read.